In the last post I described how to make a deflection measurement on a tripod, and here we will do just that. 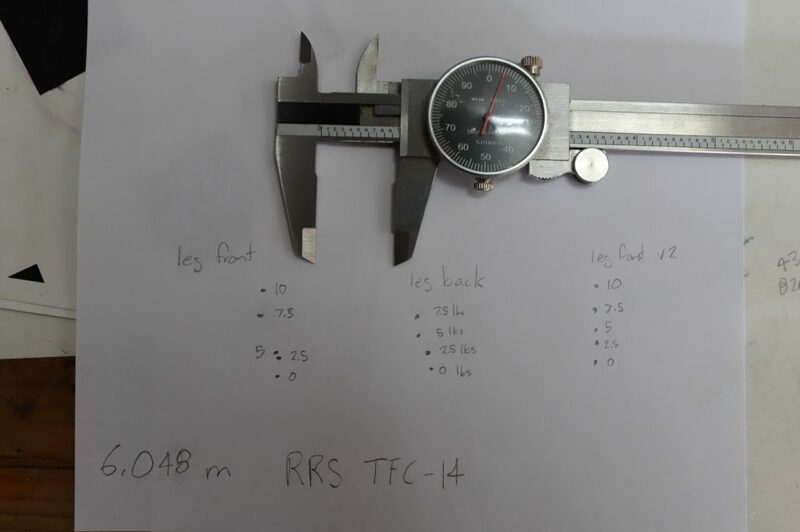 I am going to test the same Really Right Stuff TFC-14 tripod used in the torsion spring frequency test, which will allow us to compare and contrast the two methods. The basic idea of the deflection test is to place some weights cantilevered on a bar away from the tripod apex, and then measure how much the tripod deflects with a laser pointer. Pretty simple. I took two sets of data, one with a leg of the tripod aligned with the front of the camera bar (leg front) and one with a leg aligned to the back (leg back). This was to account for the possibility that the rigidity of the tripod is dependent on orientation. 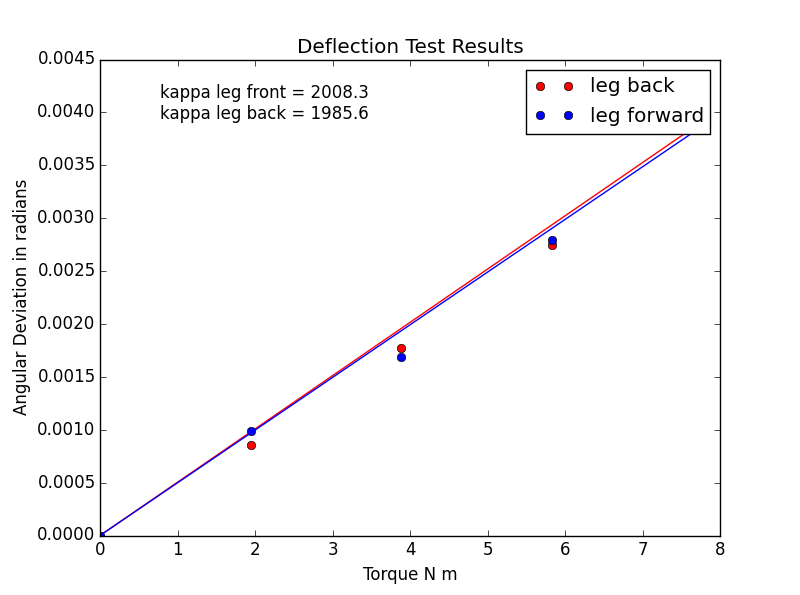 In the data shown above, there are two data sets for leg front, this is because the tripod shifted oddly under the weight in the first trial. The second trial (v2) is the one reported here. The slope of the line is the stiffness constant . We can see that the stiffness for the two orientations is nearly identical. The fitted stiffness constant is about . Using the oscillation torsion spring test, I previously calculated the stiffness about a radial axis for this tripod to be . The good news is that these results are reasonably consistent with each other, indicating that we are measuring the same attribute of the tripod. However, they differ by about 20%. One possible explanation would be that I am severely overestimating the amount of rotational inertia present in the oscillation measurement. The deflection test does not rely on any estimation of the inertia so that error would not carry over. Given however that all of the approximations I make understate the inertia, this seems quite unlikely. More likely is that the deflection test has an unbalanced load on the tripod, causing the tripod to move in a slightly different way. This was evident while performing the test, as the feet of the tripod broke friction with the concrete floor as more weight was added. The measurement techniques for the deflection test are vastly less precise than measuring the frequency of oscillation. Making pencil marks to denote the laser position, and then measuring the distance between those marks is prone to inconsistency and error. The deflection test also takes a lot of time to perform. The procedure is very manual. These factors make the deflection test medieval in comparison to the oscillating torsion spring test. I will not be using deflection as part of my general reporting because it measures the same thing in a worse way. The one upside of the deflection test is that it requires fairly basic equipment to perform. As a first test on a tripod, this is the way to go.